I'm Jenny and I'm a former bored couch potato! My husband and I are Northern Europeans who felt that we were stuck in a rut and the answer for us was to pack up and move to the other side of world - Auckland, New Zealand. Where we now live with our 2 Birman cats. Now I'm probably never going to bungee off a bridge or throw myself out of an aeroplane, or any of the other adrenaline sports that NZ is famed for, but instead I do activities that I enjoy, like running, hiking, ice skating, hot yoga and dance. I still spend some quality time with my couch knitting, reading and watching TV - I wouldn't want it to feel neglected! 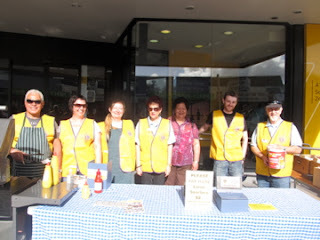 Moving from a city flat to a suburban house has opened up other opportunities to be involved within a community and I serve my community through Lions Club and I sing in a community choir. There's a lot to get used to - I know and talk to my neighbours! I have a garden that I have to look after and I feel responsible for the wellbeing of the wildlife that call my garden home too. I love seasonal food, wines and beer, Earl Grey tea, lime soy shakes, and root beer. Alas, my love of food and former couch potato ways have left me with excess weight that isn't best for optimum health. So this is now my new goal, to become the healthiest version of myself. I like to write about what's going on in my life; what I'm doing, planning, eating, making, growing, reading, etc. I love reading other peoples lifestyle blogs too because I get ideas and inspiration to try out new things and have different perspectives and experiences via other people that I mightn't otherwise have in my own life. I would love for you to join me on this journey and I would love to hear from you!